Are you feeling like you’re in a running rut? Don’t let it drag you down by thinking about it as negative but turn it into a positive experience. 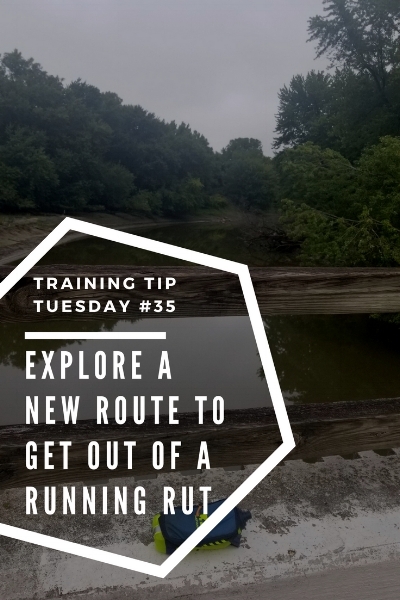 Let it be a force to push you to try new things with your running. I was feeling in a rut when I decided to add in speedwork earlier this summer and now I’ve been feeling like my running was starting to get in too much of a routine again (and not in a good way). One thing that I noticed is that I tend to run the same routes over and over again. It’s hard to mix-up my weekday routes because of time constraints but even on the weekends I was choosing the same routes. Now, for the last two weeks, I’ve been trying to go to new places for my running. I’ve gone to two Minnesota State Parks and also made the choice to detour off my usual running route. And it’s making it fun again to explore new places. I don’t know exactly where the next hill is or when I’m going to hit my next mile marker. And it’s so much fun to not be thinking about my runs in that way and to explore new areas around the Twin Cities! After three trails runs at Theodore Wirth Park, I decided I was ready to try a little bit of a challenging in trail. And since we bought a Minnesota State Park permit during our camping trip in June, why not try running at a state park. Seriously, I’m still regretting not bringing running gear to Cascade River State Park because that would have been an amazing run! Luckily, we have several state parks within an hour drive from us so I had several to choose from. 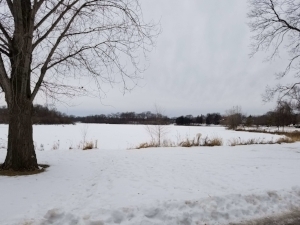 But I had read a blog post from Minneapolis Running of six trails less than an hour away from the Twin Cities and knew I really wanted to run Afton State Park. Gorgeous scenery and somewhat technical trails? Just what I was wanting! 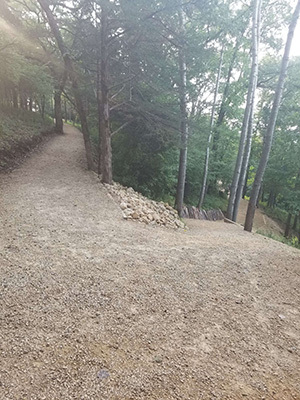 Now, I’ve got to say, I have a ton more respect for people who regularly run technical trails (especially with tough hills) after running at Afton State Park. I ran 5.5 miles of the 20 hiking trails there and it was tough. I had almost 600 feet of elevation gain over my run and there were some spots where I had to hike up instead of running because of the steepness. But on the other hand, that meant I had some fun “bombing” downhill which is an experience I’ve never had. One really great thing about running at Afton State Park (and probably all state parks) is how well marked the trails are! I had no chance of getting lost, even with my sense of direction, with how many trail maps there are out there. It also really helped me plan which way to go as I was running because the distances between points are marked and I could go “Oh, let me get in a little bit mileage and take this route instead” and end up at the same place. And the views are spectacular, you get a little bit of everything from the river, to forests, to restored prairies. I couldn’t help but stop and take tons of photos because it was just gorgeous, especially with the blooming flowers. I cannot wait to get back out to Afton during the fall and spring to see how it changes throughout the seasons. And even though I saw plenty of people (including lots of runners) on the trails, it was so quiet and serene. 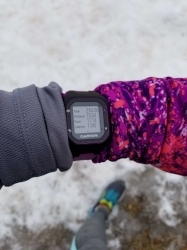 Do you have a trail running recommendation for me? 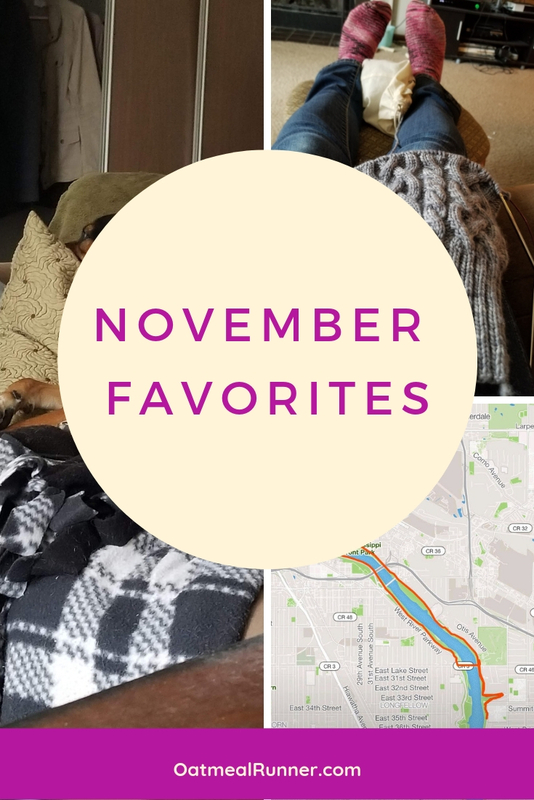 Let me know in the comments where I should be trying to get a run in (hopefully around the Twin Cities area)! Today I’m doing something different and sharing some photos from my long run on Sunday, February 18. It was a windy (17-20 mph) and chilly run, plus a little bit tough. 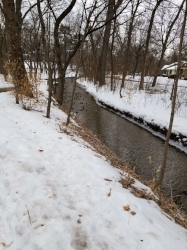 I ran a couple of the lakes in Minneapolis (Bde Maka Ska Lake, Lake of the Isles and Lake Harriet) and also a little bit of the Minnehaha Creek. The view from right at the start of my run, looking out at Bde Maka Ska Lake. I haven’t run the lakes since the Twin Cities Marathon on October 1 and it’s so different looking in the winter! Lake of the Isles is always so deceptive in how long it takes to run around it. Probably because the isle makes it so you can’t see straight across the lake. Since the lake is frozen, there was plenty of people out on the lake itself. Ice fishing, skiing, walking and even biking! Back to the other side of Bde Maka Ska Lake. This view is almost looking across to where my car is parked. There was a good amount of traffic on the paths although nowhere as bad as it can get in the summer. After I finished around Bde Maka Ska, I ran around most of Lake Harriet. I didn’t stop to take a photo because it was so windy and I was running right into it most of the time. But then I went onto a new to me path! I’ve ran along Minnehaha Parkway closer to the Mississippi River but I haven’t gone along this path from the lakes along Minnehaha Creek. It was just like being in a little wooded area and I found where all the ducks are hanging out. Just around the bend there was a ton more ducks (they were crowded in that little creek). Finished with the run, pretty exhausted and ready to go home! Running those miles into the wind really takes a toll on you (especially with the cold).